Has Science Done Away With Faith? These two groups of people are clearly talking past each other. They don’t even speak the same language. Literally. Because they have defined their terms differently. When people disagree about the very meanings of the terms that they are using, not only is it virtually impossible for them to reach meaningful conclusions together, they can’t even argue with each other with much coherence! We will never get to the heart of these discussions until we learn to speak each other’s languages. So, this post is really all about definition of terms. What is science? Is it a process of gathering information and recognizing patterns in the world through observation and repeatable experimentation? Or is it a somewhat nebulous group of millions of academics and researchers who claim to use this method, and the composite body of conclusions that they have drawn? Is it a blind leap into the dark based on tradition and subjective feelings of spirituality or compulsion? Is it an insistence on holding certain views despite a lack of evidence, or even in the face or substantial contrary evidence? Or is it a conclusion drawn where mathematic certainty is impossible, but where much real world evidence is evaluated by reason in order to make an educated and intellectually honest decision? To complicate matters, “religion” is often used interchangeably with faith, though its definition is much more narrow and indicates not a mental process but a body of practices or doctrines. Similarly “evolution” is sometimes used interchangeably with science, though it is neither a process of learning nor the body of evidence gathered by a branch of academia, but simply one prominent theory within that branch. Before we even start arguing about religion or evolution, we at least ought to agree on the role of science and faith in the discussion. 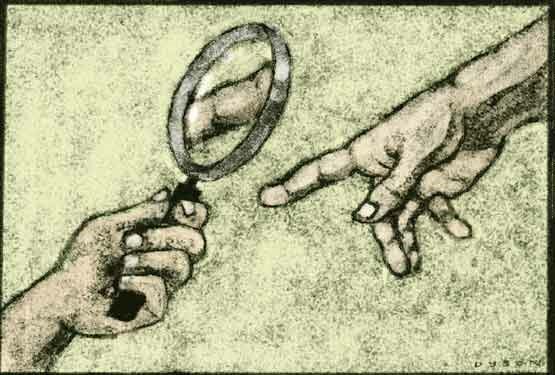 If faith is a belief based almost solely on superstition, subjective experience, or tradition (as atheists understand it to be), and science is the knowledge of patterns in the world gained through repeatable, testable experiments (as they believe all conclusions in the scientific community to be), then science offers far greater certainty than faith, and ought to supersede it. But on the other hand, if faith is a conclusion, be it one without 100% objective certainty, reached by the use of reason acting upon verifiable evidence, and science is the branch of human institutions that adhere to the scientific method, then indeed, the two walk hand in hand rather than being mutually exclusive. The contemporary atheist often tends to confuse the two definitions of science that I have provided, not even recognizing a distinction. He understands all conclusions supported by the scientific community to be fact simply because they were reached by a community that claims to observe the scientific method. But in so doing he not only grossly underestimates the possibility of human error, he also turns a blind eye to the truth about countless “scientific facts” that are neither testable nor repeatable but are rather touted for their “explanatory and predictive mechanisms” and rely on various untestable assumptions. To take any assertion made by the majority of the scientific community, and claim that it is fact simply because “it’s science” without actually presenting the nature of the experiments, data, and conclusions for yourself, is nothing more than the logical fallacy of appeal to authority. Of course, the atheist would argue, the science that has disproven God is so complicated that you’ll just have to trust the experts. It is indeed valid, but an appeal to authority is necessary since you wouldn’t understand the explanation. This is why you often here so little science in a debate about the existence of God, why it is rare to see much scientific depth from atheists themselves in their arguments. Faith does not need to be blind. It is not always based on tradition or spiritual compulsion. In my case, it is a conclusion I’ve drawn about what I can’t know for sure, based on all of the things that I can know. Much of those things that I can know are indeed derived from science. And they are repeatable and testable. In fact, I dismiss nothing from science that is repeatable and testable, and yet I find it beautifully compatible with my faith. Read more of my articles or start a discussion in the comments if you’d like to learn more.